Papaya Leaf Tea: A Natural Healer for Erectile Dysfunction? Various drugs are on the market specifically to enhance blood flow for men with erectile dysfunction. 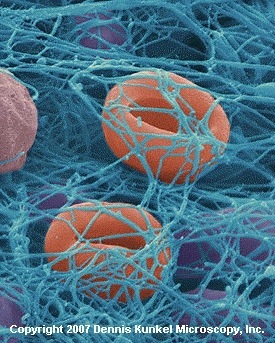 Papaya leaf tea is a natural proteolytic enzyme that offers specifically the enzymes papain and chymopapain, plus the necessary natural components to allow your body to absorb and execute this amazing function of dissolving the “spider webs” of fibrin [as pictured] from your blood so that oxygen can reach your cells. Theoretically, this action may have an effect on erectile dysfunction. A lack of oxygen to the cells also creates an environment for cancer and heart disease.